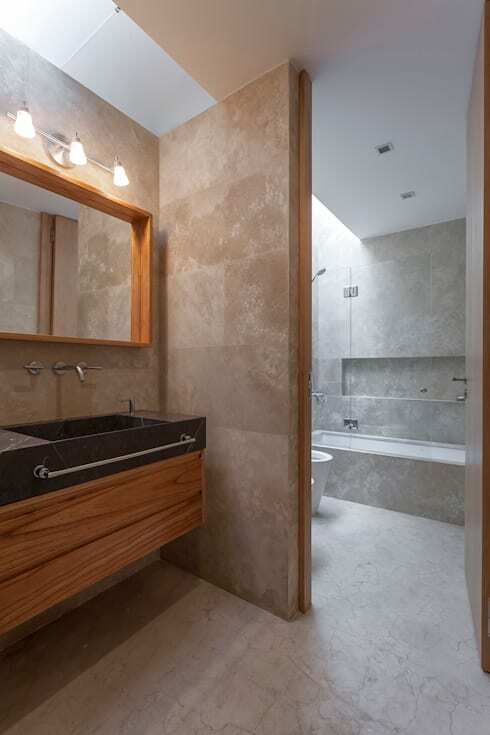 It is rare to see polished marble and raw concrete teamed together. The former is associated with traditional elegance and the latter epitomises the current trend in raw materials and industrial authenticity. 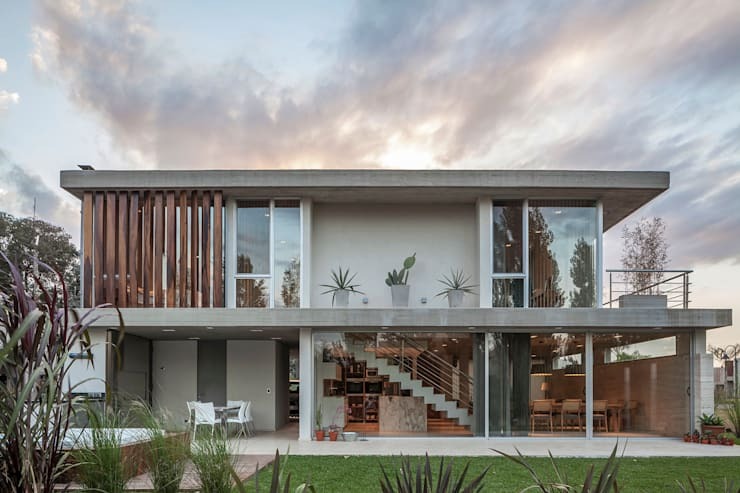 But in this perfectly modern Argentinian home, the pearly grey beauty of these materials are a perfect match. 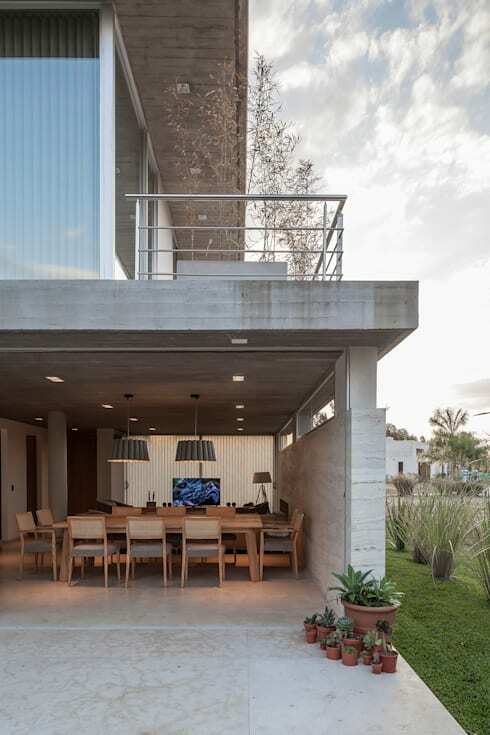 The architects Estudio Geya have created a home that doesn't neatly fit into any one category. It is raw, sophisticated and brimming with a natural sense of abundance. It covers a vast 275 metres square and is arranged on a series of concrete slabs. And yet, the home is perfectly warm and suitable for sociable family living and entertaining. So if you love the beauty of modern homes and understated luxury, come with us on a photo tour. The Haras House is sure to appeal! 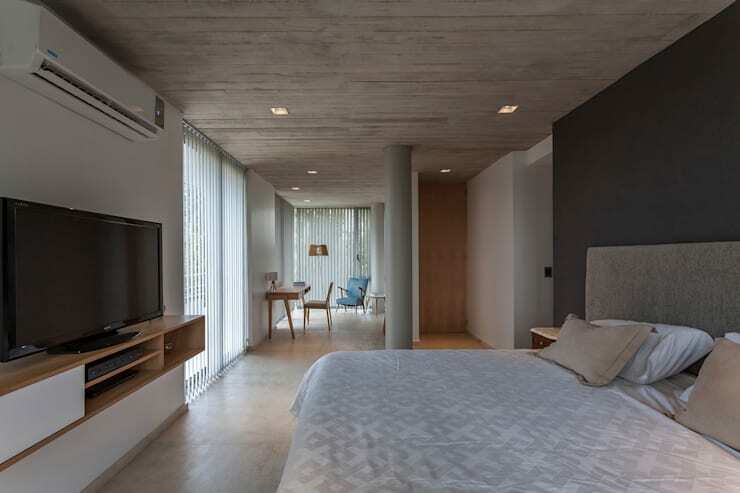 The home is a flat-roofed construction replete with raw wooden and concrete materials. The floor-to-ceiling glass walls and open garage promise a home with a bright, open appeal, but the occupants still enjoy lots of privacy. This is due to the blinds on the lower level and the closely arranged wooden panels on the upper floor. The front here is orientated to the west. From the rear of the home we get a sense of the sociable layout of the home. The ground floor is dedicated to social and common areas. So here we have the living room, kitchen, toilet, garage, laundry room and an outdoor patio. Upstairs we have two children's bedrooms and a master suite, with a desk space and a terrace. The home is arranged around a central box. Above the kitchen and bathroom are the upper-level bathrooms and water tanks on the roof. 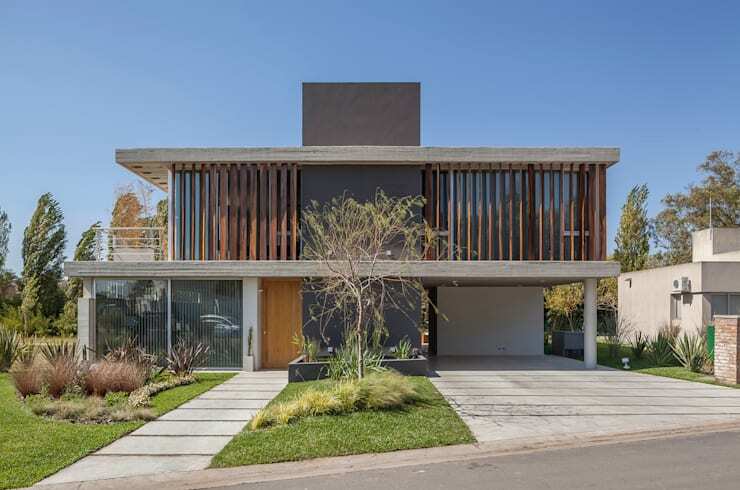 The Haras House is located in a new district of Buenos Aires with another residence on the right hand side. The ground floor is almost completely open on the rear to allow abundant light to flood the interior. At the same time, privacy has been retained by the use of a high, narrow window panel. All the materials have been left in their original state. Here in the sophisticated grey living room we have concrete slabs, smooth cement floors, cream marble and travertine. 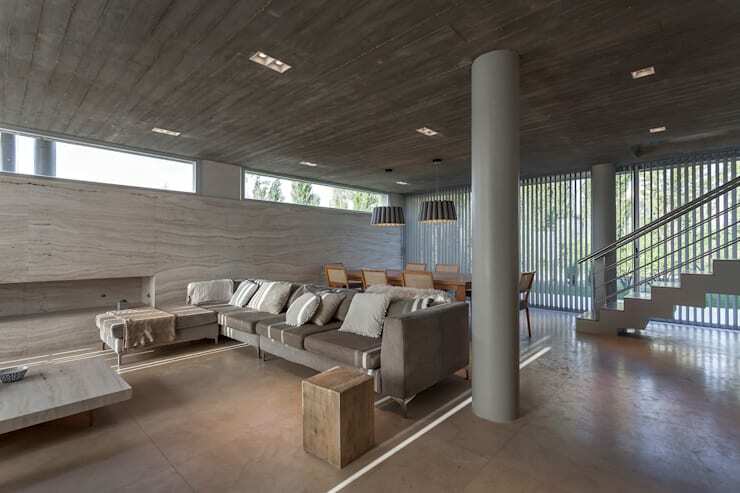 The natural undulations on the wall and ceiling infuse the living room and columns with a natural, authentic beauty. The main living area has an open-plan layout. But the boundaries of the striking white marble kitchen are clearly distinct. Much of this is due to the simple arrangement of a large kitchen island and a lowered white ceiling panel. The kitchen is perfectly integrated into the cool grey decor, but it has its own feel. The master bedroom has a serene, natural feel. Aside from the grey-blue feature wall on the right, the feel is not particularly different from the lower levels. As we can see here, simple, raw decors have a very subtle and flexible aesthetic that is suitable for very different living areas. Note the lovely exposed supporting column and study area in the background. The ensuite bathroom and dressing room have no ornamentation. 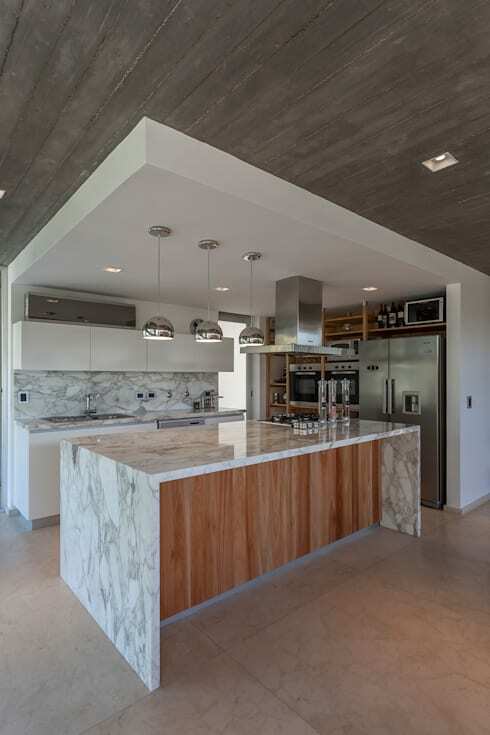 The rooms have unbroken lines and the raw beauty of the marble, travertine and wooden finishes dominate the space. But as with all the other rooms we have explored, there is a subtle, luxurious feel to the bathroom. This is a home that shows just how powerfully raw materials can make a simple modern abode feel abundant. If you love the subtle beauty of this home, you're sure to enjoy The home of monochrome opulence. What do you think of the raw, serene beauty of this modern home? Let us know in the comments field below!